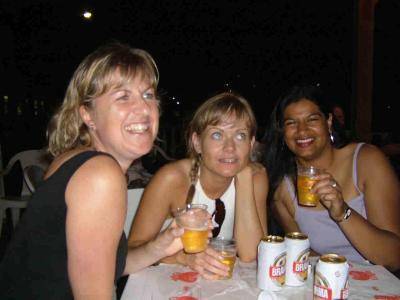 Blog from Rio, Brazil | Where's Suzie? Sorry about the lack of pictures...gonna try again today. Think we're up to day 7 now. Another early start and minibus trip for all of us. 1st stop was Niteroi island. Took a boat trip across the Guanabara bay and went to a weird art gallery. Art was a bit crap but the views and the building itself were fantastic. We went straight from there to a fort on top of a hill (Fortelaza de Santacruz I think) which was built to protect the island. Next was another eat all you can for ? Reals meal and then we headed back, this time along the long bridge, back to the mainland. Next stop was Sugar Loaf mountain. All the other guys went on the cable car to the top but I decided against it as it was really hot and I was feeling a bit ratty after the long journey in the minibus. Instead I sat on the beach at the foot of the mountain and drank coconut milk with the tour guide. The bay was really calm and not very busy and was just what was needed after the busy morning. Once everyone was back down the mountain we headed off to Monica's parents place at the foot of Sugar Loaf (it's literally in their back garden!!!). They live on an army base and they'd organised a bbq for us all (a tradition in Brazil apparently the night before the wedding). Again there was lots of meat and alcohol....Sergio's (Monica's dad) Caipirinhas were the best I've tasted so far. Things got a little out of hand later that night but I won't reveal all (unless Baldev does something to upset me ;-)). All in all though it was a really fun evening.